FMB 43957 was but just one of hundreds of the type built for use as the Officer's boat, duty boat or the Captain's boat on larger ships. Some were fitted out as barges or senior officers boats, and 43957 was indeed one of those. Of the 654 ordered and of which 509 were built by 24 different yards, 43957 was ordered as part of a batch of a dozen boats from Staniland & Co Ltd, Thorne on the 20.10.43. The FMB was the first of the batch and was completed on 18.07.44 and then delivered by rail to Aberdeen. Her destination was the Dido class cruiser HMS Diadem (5,950 tons) having been allocated to the cruiser on the 06.09.44. The cruiser had been in action in the Brittany area, and although not confirmed, her boat may have been damaged which consequently called for a replacement to be allocated to the cruiser. Shortly afterwards the cruiser was on Arctic Convoy duties, then off Norway until the end of 1944 in company with HMS Mauritius. Early in 1945 HMS Diadem, with Vice Admiral Dalrymple-Hamilton onboard, was again in action which included an engagement with the German 4th Destroyer Flotilla. The cruiser was also once more on Arctic Convoy duties during March & April 1945, and in May the same year operating off Narvik. Post-war the FMB was confirmed as still on the cruiser in 08.48 when she was Flagship of the 2nd Cruiser Squadron, however the FMB was listed as at Chatham on 20. 12.49 coincident with HMS Diadem going into Reserve in 1950. The cruiser was later transferred to the Pakistan Navy and became PNS Babur, however the FMB 43957 was confirmed at Chatham until 02.07.53. A few months later the FMB was allocated to the Fleet Aircraft Carrier HMS Ark Royal (36,800 tons), on the 03.10.53. The carrier had been launched in 1950 and was first commissioned on 22.02.55. The FMB was either retained at Chatham, or more likely despatched to Birkenhead to be loaded on board the new carrier. The FMB remained on HMS Ark Royal until the latters major modernisation period of 1967-70, which was carried out at Devonport. With modern post-war built craft then available and more suitable, the ageing FMB was landed into retirement. The craft was most likely replaced by one of the two Mk6 34ft FMLs 6814 & 6815 which were assigned to the 1-IMS Ark Royal from 1969, but which did not join her until 1970-71. After a short period in Reserve the FMB 43957 was advertised for sale by tender, as lying, at Devonport on the 12.09.72, her hull fair but her engines removed. 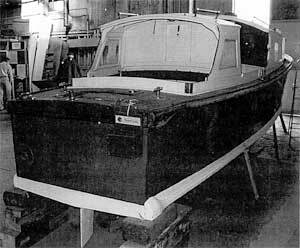 The craft was obviously sold and ended up some years later at the National Motor Boat Museum where she remained under wraps through 1994 to early 2002. 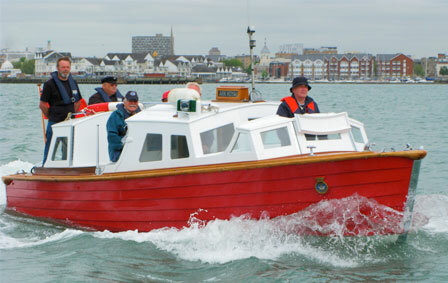 In January 2002, FMB 43957 was handed over to the British Military Powerboat Trust at Marchwood. goes home to her original owner. February 2005.